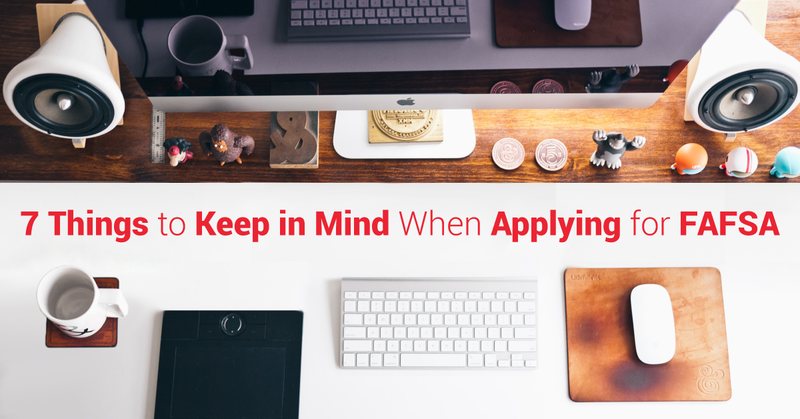 The advent of tax season signals the approach of another deadline: Your FAFSA application. Whatever program you’ve enrolled in, you should submit the Free Application for Federal Student Aid, especially if you intend to receive funding from Federal Title IV Financial Aid Programs. At AmeriTech, we’re committed to educating our students through the financial process, with entrance and exit counseling. Before much of that, though, future Medical Assistants and nurses alike need to apply to the FAFSA. It can be a little complicated, and because errors can affect your eligibility, we’ve assembled these seven things to keep in mind. Even if you’re sure you’re eligible for financial aid, or if you received it last year, waiting to apply again can literally cost you. Many states have a limited number of grants, which they distribute on a first-come, first-serve basis. This can penalize late-comers but should also incentivize every student to apply as soon as possible, even those who didn’t expect any kind of aid. If you submit your FAFSA early enough, you’ll face less competition for available funds. Officially, you can file your FAFSA as late as June 30, 2015, but state and institution deadlines are often much sooner than that. As many as 30% of FAFSA applications go through a verification process with the IRS, which scrutinizes the information to ensure it’s correct. Any error or falsified data can jeopardize or at least delay your application’s approval, putting your potential funds at risk. If you apply online, the system will catch many (but not all) errors, especially blank spaces. Paper applications, though, should be read thoroughly before filing. Even if a question doesn’t apply to you, or your answer is zero, write “0” so the verification system doesn’t process this as an error. Even if you didn’t live with your parents primarily over the past year, if you’re legally financially part of their household, you should include yourself in the tally. This won’t just increase your ranking in financial aid need—it’s the correct total, which will help you avoid registering errors. Easily, one of the biggest (and easiest) mistakes to make when students file their FASFA is entering incorrect financial information. Forgetting a source of income or declaring different assets as reported on your tax return can hurt or delay your application. The IRS Data Retrieval Tool alleviates some of those problems. It takes information on your IRS tax return and automatically fills out some of the forms on your FAFSA. This tool, specifically, is great, but whenever you can utilize an automative program on FAFSA’s website, do. Students can live on their own, pay their own bills, and plan to finance their own education while still being considered dependents of their parents in the eyes of the state. This is hugely important, because if you are legally a dependent, you need to know and submit your parents’ and any step-parents’ financial information. Not sure? Consult the resource below. On that note, you should prepare everything you need before you begin to file your FAFSA. Having all the documents and information in hand will reduce the risk of entering anything incorrect—or incorrectly. You’ll need your Federal Student Aid Pin, your social security number, financial records, and more. Use this checklist to assemble everything before you apply. This blog post alone is a lot to take in, and applying for the FAFSA itself is more complicated. It’s common for students to have questions about federal financial aid, and it’s better to ask them than to risk a mistake on your application. The FAFSA website has many pages devoted to common questions, but friends, classmates, and family can help too. Like any federal financial form, the FAFSA can be complicated, but it’s only once a year, and applying early and correctly can only benefit you.